Charlie’s parents have said they hoped to bring him to the United States for an experimental treatment, but a months-long legal battle gave Great Ormond Street Hospital for Children permission to withdraw life support, inciting condemnation from the Vatican to the White House. But the father of an American boy with a similar disorder told STAT that he put Charlie’s parents in contact with the physician who successfully treated his son, Dr. Michio Hirano of Columbia University Medical Center in New York. Hirano did not reply to a question about whether he had been contacted. A mutation. In the form of the disease that Charlie has, it’s in a gene called RRM2B — thus the full name, RRM2B-related mitochondrial DNA depletion syndrome. The RRM2B gene codes for the production of an enzyme called ribonucleotide reductase, which helps produce the “letters” (nucleotides) that constitute DNA, designated A, T, C, and G, in cell structures called mitochondria. By producing nucleotides, ribonucleotide reductase keeps mitochondria supplied with the DNA they require to operate, in particular to produce energy vital for cells to function. But RRM2B mutations reduce the quantity or quality of ribonucleotide reductase, impairing mitochondrial DNA and therefore the mitochondria themselves. You must inherit two copies of the mutated gene, one from mom and one from dad. If you inherit only one copy, the healthy one is sufficient for ribonucleotide reductase function, but you are a genetic “carrier,” as Charlie Gard’s parents apparently are. Has anyone been successfully treated? The American boy with a related mitochondrial DNA depletion syndrome is stable and doing well, his father, Art Estopinan, told STAT. His son Arturito was born in 2011 with a mutation in the TK2 gene, another mitochondrial enzyme, which lies on chromosome 16. So does that success bode well for Charlie? It’s not clear. “No cures and few effective treatments exist for any form of mitochondrial disease,” including the one Charlie has, experts warn. Arturito’s case might not be relevant to Charlie’s. Arturito’s mutation impaired an enzyme called thymidine kinase 2, which is active in mitochondria. It acts as a sort of quality-control supervisor: It helps produce and maintain the genetic material inside mitochondria, called mitochondrial DNA, by breaking down and recycling the building blocks of mitochondrial DNA. That is, the enzyme takes DNA building blocks (called nucleotides) that aren’t supposed to be in a particular spot in the mitochondrial DNA, disassembles them, and reassembles them into the nucleotides that are supposed to be in that spot. That repairs error-filled mitochondrial DNA. If the TK2 gene is mutated, however, the thymidine kinase cannot make the requisite repairs. In that case mitochondrial DNA accumulates fatal errors, crippling the function of the mitochondria. After a long medical odyssey, Arturito’s parents took him to Columbia, where Hirano has been developing an experimental therapy, said Estopinan. Arturito initially received the DNA building blocks, nucleotides, to substitute for those his missing enzyme would ordinarily generate. Now he receives thrice-daily doses, through a gastrointestinal tube, of nucleosides, which differ from nucleotides by a single molecule: That allows them to cross into cells more easily, and once inside they are converted to nucleotides. Has the Columbia researcher reported any of his results? According to a recent animal study that Hirano led, the treatment consists of oral doses of deoxythymidine monophosphate and deoxycytidine monophosphate, which are converted to molecules required for the synthesis of mitochondrial DNA. In lab mice with the TK2 mutation, the regimen postponed the onset of mitochondrial depletion syndrome, reduced the severity of symptoms, and prolonged the animals’ lives. But no study of human patients has been published. Hirano is currently recruiting patients for a clinical trial intended to establish a registry and biobank for mitochondrial diseases, but he has no studies registered at clinicaltrials.gov indicating that he is conducting a study intended to test experimental treatments. Other experimental therapies are being tested in lab animals, but in general the most they can do is prevent mitochondrial loss from getting worse. 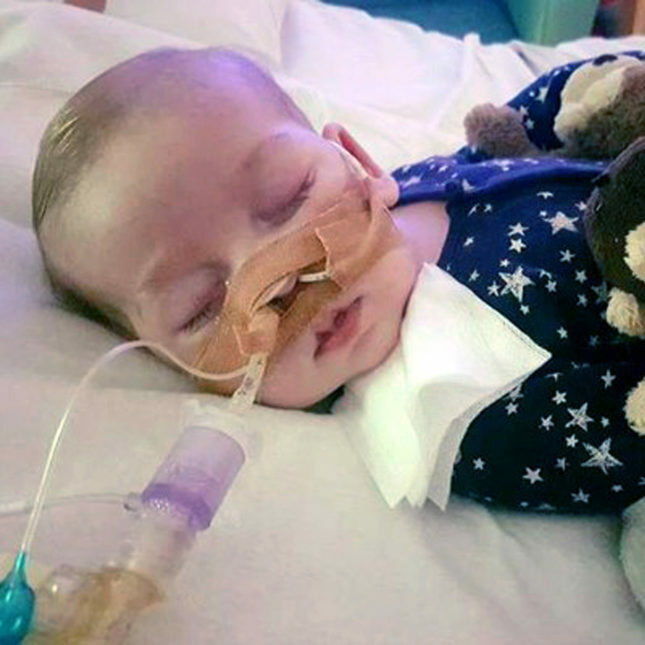 If crucial tissue or organs have already been severely impaired due to crippled mitochondria, as is apparently the case with Charlie Gard, there is no evidence anything can help. How common is RRM2B-related mitochondrial DNA depletion syndrome? It’s extremely rare. By one count, only 15 cases have been reported in medical journals. Charlie’s parents have said he is the 16th.